FIBER SAMPLER: Try them all! Labeled 1/8 lb. 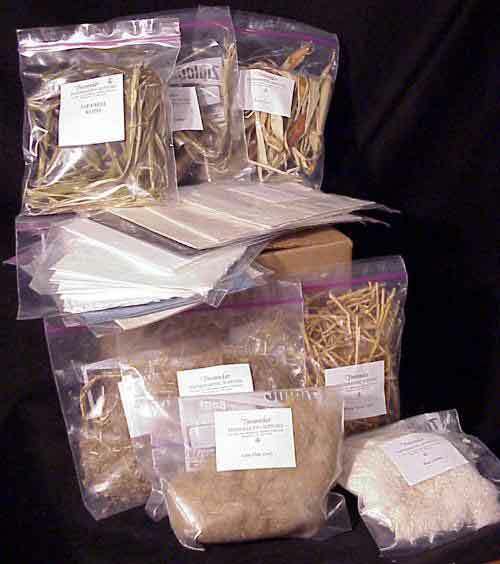 samples of each of the fibers we carry. These larger samples contain enough fiber to test and still leave enough to keep as a permanent reference. Cotton (botanical name Gossypium) is a strong, versatile fiber that comes in many forms. It is a 'seed hair' as it surrounds the seed in the cotton ball. When the cotton is ginned, the long 'staple' fibers are separated from the seeds, these fibers are Raw Cotton. Most of this fiber is used to make cloth. It is cooked and cleaned. Cotton scraps from the garment industry are an economical source for cotton rag, which we call Cotton Rag Half-Stuff, as it is ready for beating. After ginning, the remaining seeds are covered with a fuzz of cotton fiber. When cut away from the seeds, this is the source for cotton linters. This fiber replaces cotton linter #27 which is no longer produced. It is a first cut linter a little shorter than the #27 but suitable for casting. It is also suitable for sheet forming when a soft or absorbent paper is desired. 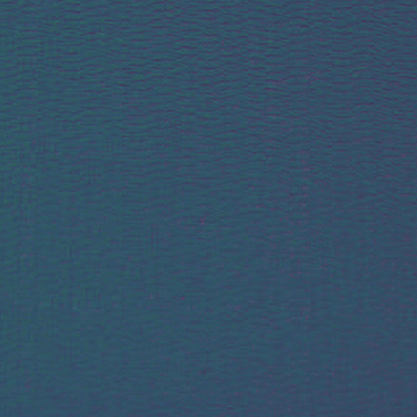 First cut linters used mainly for sheet forming but can also work well in 3D media. Both types of cotton linters fiber come in sheets measuring about 30'x 38' and weighing about 10-12 ounces and are priced the same. Please note, they are priced by the pound rather than by the sheet as the weight per sheet can vary. Proper beating in a Hollander is best. 2. COTTON RAG This is 100% Staple Cotton that is called 'rag' because it is made from new garment cuttings. Staple cotton is a much longer fiber than linters and makes a stronger, harder sheet of paper that shrinks more in drying. It is well-suited for watercolor and book papers. 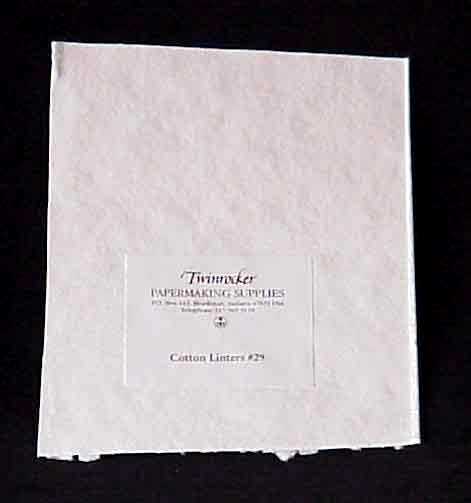 A bleached cotton muslin that is warm white in color. Rag fiber is called half-stuff because it has been broken out of the cloth into near thread form. 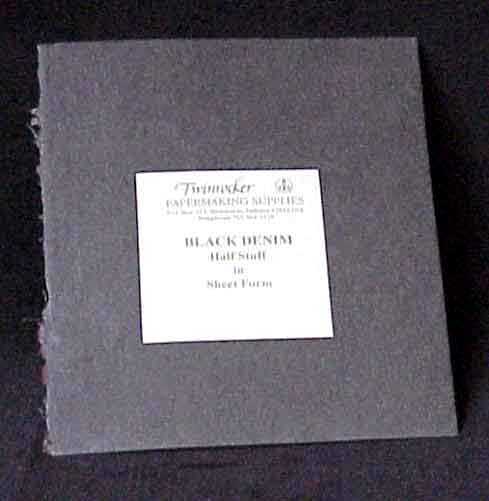 Made from black denim cloth in sheet form ready for beating into a pulp or use your blender. This black cotton makes a beautiful black paper and is also wonderful to add as a fleck to other pulps. Available by the pound. Made from faded blue denim jeans the fiber has been pressed into sheets ready to beat into pulp. It will make a strong pulp for paper or can be added to other pulp as a decorative touch. Abaca (botanical name Musa textillis) comes from the leaves of a type of banana tree grown in the Philippines and is often called Manila hemp. Abaca has qualities of Oriental & Western fibers and can be used with or without a formation aid. Pale, actually off-white. Comes as half-stuff in sheet form, ready for beating. It is a very long fiber that is high in tear strength. It is soft if prepared in a blender and hard and rattly if prepared in a beater. Hemp has a long history as a papermaking fiber; it was as common as linen in Europe from the 14th to the 18th century. Hemp makes a very strong, rattly paper with high shrinkage. Hemp fiber that has been cooked and partially prepared in a Hollander beater. 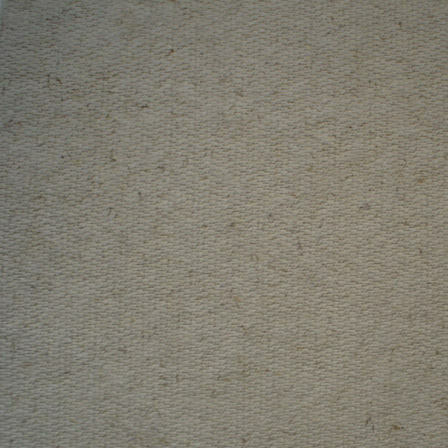 The fiber is beige in color with fleck, having been lightly bleached. It is in sheet form, ready for beating. It is called half-stuff because the cooking and breaking is about half the preparation needed and the hemp is, therefore, half-prepared. The flax plant (botanical name Linum Usitatissimum) is used to make linen cloth. 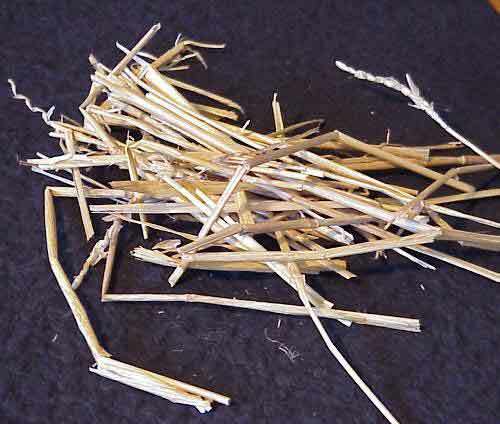 It is called a 'bast' fiber because it comes from the inner bark of the plant. Raw flax fiber is very long, strong and interesting. Must be cooked in a caustic solution to remove the non-archival impurities. 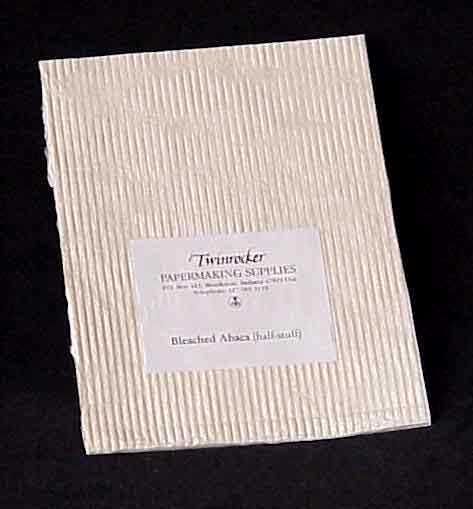 This fiber makes a strong paper that is hard, brittle and rattly but, will shrink considerably in the drying process. Used alone or mixed with other fibers, flax adds strength and aesthetic interest. 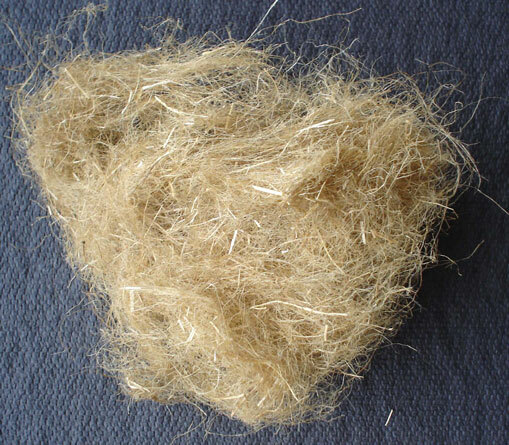 This is an unrefined fiber with straw and other impurities. It must be cooked for papermaking. Long, loose strands of fiber ready for cooking and beating (also suitable as is for weaving or sculpture). 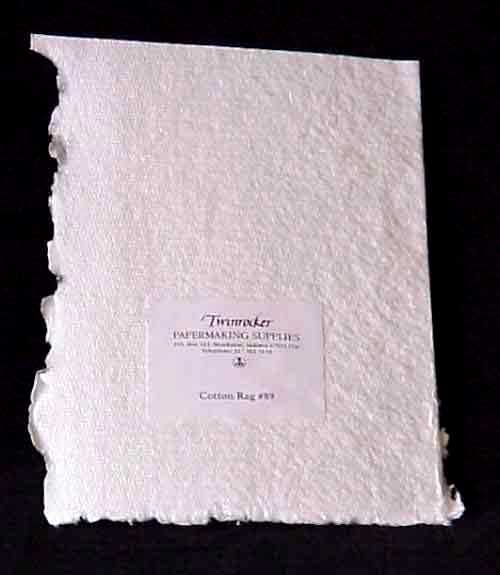 Kozo is the most common of the Japanese papermaking fibers. It comes from the inner bark of shoots of the Kozo (Paper Mulberry) plant, which are harvested annually. 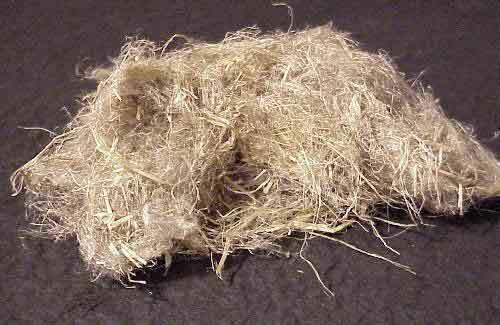 Kozo fiber has three layers of bark: the outer black bark, green bark, and the inner white layer. This fiber is strong and very long but must be cooked in a mild caustic solution (soda ash) before using. It is much easier to beat than cotton or linen, in fact, can be beaten by hand. A Hollander beater is much too severe for Kozo. Traditional sheet forming requires the use of a formation aid. We do not offer Kozo in pulp form as it works better when beaten by hand or with a stamper. Thailand kozo is not considered as high in quality as Japanese kozo because the winters aren't as cold. This fiber we carry has had the black bark (chiri) removed, which saves you a lot of chiri picking. The secondary green bark layer has been removed (mostly) as well. Golden wheat straw (raw) from the Brookston area of Indiana. It makes non-archival paper unless cooked in a caustic solution, which removes the impurities but leaves most of the color. Note: As of August 16, 2017, Wheat Straw is only available in wet, ready-to-use pulp.